The Borchardt C-93 pistol (Selbstlade Pistole Borchardt Construktion 1893) was quite possibly the first ever mass produced semi-automatic handgun, and certainly one of the most influential. It was designed and patented by Hugo Borchardt, a German-born gun designer and manufactured in Germany between 1893 and 1899. The first manufacturers were Ludwig Loewe & Co (about 1000 pistols made before 1897), and then DWM (Deutsche Waffen und Munitionsfabriken). 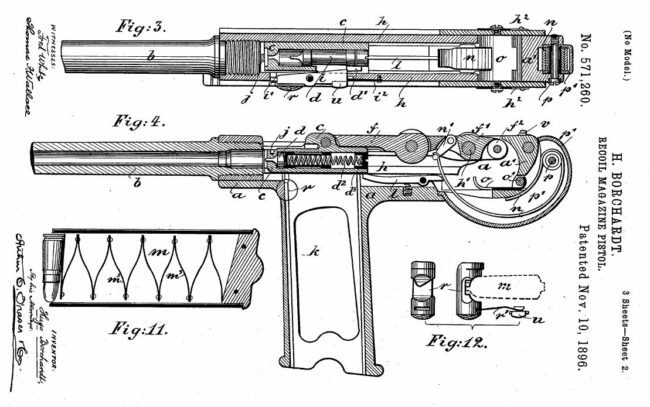 Total production was relatively small, about 3,000 guns, but it served as a starting point for more successful models, most notably the famous Luger ‘Parabellum’ pistol or P08. Ammunition for the Borchardt pistol, the 7.65x25mm bottle-necked cartridge, also served as the basis for subsequent successful developments such as 7.63×25 Mauser and 7.65×22 Luger. It must be pointed out that 7.65×25 Borchardt and 7.63×25 Mauser cartridges are dimensionally similar, but the latter is usually loaded with a more powerful charge. Therefore it’s not advisable to fire 7.63mm Mauser through surviving Borchardt C-93 pistols, which are considered to be exceedingly rare and expensive collectors’ pieces today. 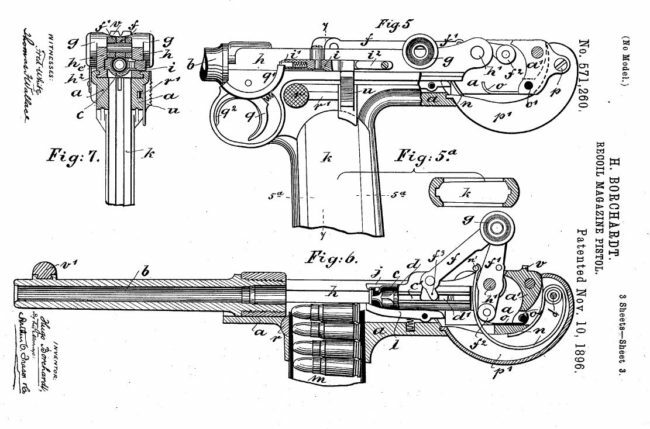 The Borchardt C-93 pistol uses a short recoil operated, locked breech system. Its bolt is locked by a toggle-lock system inspired by Hiram Maxim’s machine gun. Upon recoil, a toggle is broken up by a roller, attached to the rear end of the rear toggle link, riding the curved surface inside the bulbous rear end of the frame. A flat return spring is located below the toggle, also in the same bulbous rear extension. The trigger is of single action type, striker fired. A manual safety is controlled by a vertical slider, located above the left grip panel. A box magazine with 8-round capacity is inserted into the grip. The magazine catch is controlled by a large round button located on the left side of the frame, just behind the trigger. The Borchardt pistol features fixed iron sights. It was offered with a specially designed holster / shoulder stock, which consisted of a wooden stock with leather holster strapped to its right side.